We offer independent, straightforward, financial planning advice. 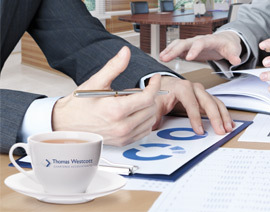 We work closely with Thomas Westcott Chartered Accountants to provide an integrated service, designed to save you time and money. We advise on pensions and retirement planning, insurance, wealth management, care fees, estate planning and more. We believe our strength is in our attitude and approach. We pride ourselves on providing a totally professional service whilst being easy to talk to and explaining issues in straight forward terms. Contact us to arrange an initial consultation with one of our financial experts, provided to you with no obligation and at our expense. Our process is designed to deliver clear and balanced advice, taking account of all aspects of your financial planning.